Today has been a busy one in Hockey Land. Teams have now begun to announce their preseason schedules as well as who they will face in home openers. The Penguins even made a roster move, inking a one year, 2-way deal with Kevin Porter. But that move was quickly over shadowed. One after another, team announcements were made as to who would face who in their first home game of 2016-2017. Penguin fans (myself included) began to "pace" back and forth waiting for the official word. All eyes seemed to be on the Penguins. The word came at 12:30 PM EST. What a nice kick in the chops for, seemingly, the best team in the NHL for most of this past season. They didn't win the President's Trophy for nothing after all. This, however, is a team that was out-played and eliminated from the playoffs (again) and will now have to watch the Championship banner raising for one of its biggest rivals. 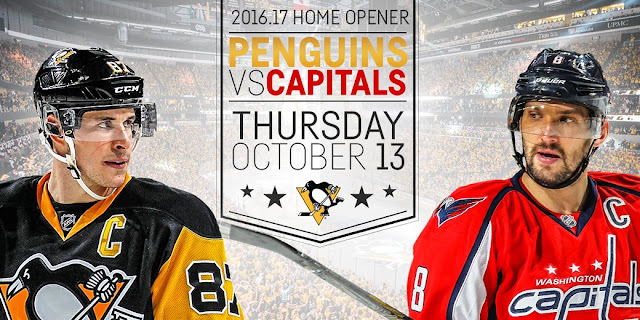 A rival that now has 2 Stanley Cups since the Ovechkin vs. Crosby storyline began. The Washington Capitals have no Stanley Cup wins since those days began (which they were reminded of on their home turf by a venomous and verbally savage mob during the playoffs). This could very well turn into a heavy and overly physical game. The Capitals are going to want revenge and even more so after having another Cup taken from them (fair and square mind you, but still taken by the better team) and then forced to watch the banner being raised. The Capitals are known for being a team that has tried to out-muscle opponents in the past. But, as they learned this past post season, you can't use muscle if you can't catch the target. They were no match for the speed of the Penguins. It will be interesting to see how the Capitals playing style changes from one season to another, or if it will even change at all. More information regarding the home opener, festivities, as well as the entire regular season will be forthcoming from the organization. I guess the only question now is...when will tickets go one sale?